A new report by the US Environmental Protection Agency concludes that hydraulic fracturing is capable of contaminating drinking water at virtually every stage in the process. The admission won’t sit well with President-elect Donald Trump, who has vowed to expand the controversial practice. In a preliminary report released just last year, the EPA said there’s “no evidence that fracking systemically contaminates [drinking] water.” Just a year later, the agency has performed an about-face, admitting there’s sufficient scientific evidence linking the controversial practice to tainted drinking water. The ESA’s final conclusions were based upon a review of over 1,200 cited scientific sources, feedback from an independent peer review, and 13 new peer-reviewed reports conducted as part of the study. 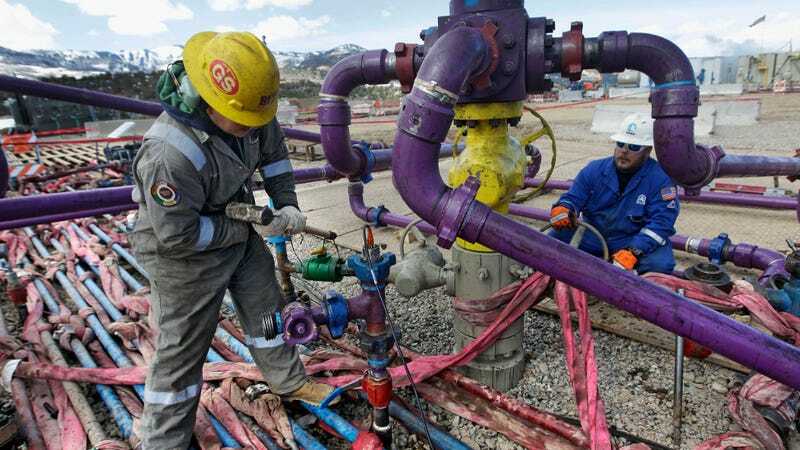 The EPA admits that “data gaps and uncertainties” are limiting its ability to fully evaluate the impacts of fracking on the nation’s water resources, saying more research is needed. That said, the environmental agency says it can no longer support its earlier conclusion stating there’s insufficient evidence linking the two. These findings stand to conflict with the views of Donald Trump, who has promised to expand fracking and roll back existing regulations on the practice. Last week, the President-elect picked Oklahoma Attorney General Scott Pruitt to head the EPA—a grim choice given Pruitt’s longtime feud with the agency and his commitment to fossil fuels. And just yesterday, Trump chose Rick Perry, the pro-fracking former governor of Texas, to head the Energy Department. Sadly, this report was issued a little too late. Trump will either criticize the report for its apparent inadequacies or choose to ignore it altogether. Worse still, and with the help of Pruitt, he may gut the EPA to prevent inconvenient reports like this from coming out in the first place.